Are you receiving the correct Diabetic Treatment? 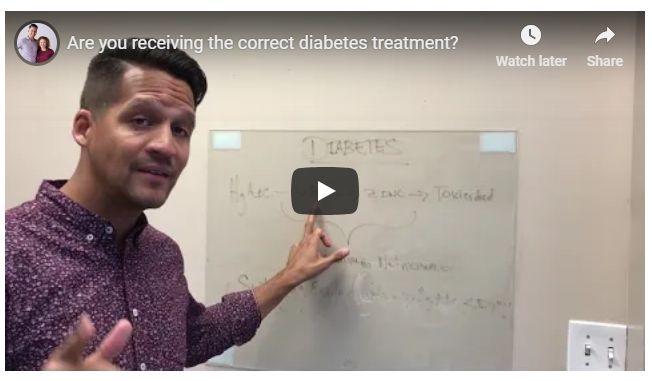 Are you receiving the correct Diabetes Treatment? Through the year I have seen multiple diabetic patient in mediation and suffering constant from this condition. One common denominator is normal blood sugar, but elevated HgA1C. HbA1c is a lab test that shows the average level of blood sugar (glucose) over the previous 3 months. It shows how well you are controlling your diabetes. An elevated HbA1c greater than 5.7% indicates that the diabetes is not well regulated and is in fact accelerating aging, increasing your chances of getting painful neuropathies, kidney failure needing dialysis, cataracts, amputations, and retinopathy blindness. What could possibly be missing? One major cause of the unregulated glycosylated hemoglobin is an unrecognized B6 deficiency. (At Pro-Holistic Care our Laboratory Testing identified multiple deficiencies that includes B6 and anemias) There is more to the story. You can take B-6 and it may not work. Because of a zinc deficiency. When hidden zinc deficiency is present, the body cannot convert B6 to its active form, pyridoxal-5-phosphate or P5P. P5P, essential in normalizing the glycosylated hemoglobin and its deficiency, is an indicator that improperly metabolized sugars are accelerating aging, cataracts, kidney failure, heart disease, nerve damage and more. But also heavy metal toxicity and mineral imbalances can interfere with zinc metabolism. I have never met a patient with Diabetes that have a nutritional test and Heavy metal toxicity ordered by their Medical doctor. To ignore fixing the chemistry in an overtly metabolic disease is outright wrong. Not regulating HgA1c by correcting the problems above results to in a tragic waste of life as well as incurring an enormous and unnecessary expense and suffering. Read more about our functional nutritional laboratory blood testing to learn more about real solution to handle your diabetes naturally, Make sure to make an appointment below. We are so excited you want to get started on optimizing your health! Thank you for contacting Pro-Holistic Care! We will get back to you as soon as possible with an appointment time. If you would like immediate assistance please call 773-279-9344. The entire contents of this website are based upon the opinions of Dr. Edgardo Vargas and Dr. Bouvin unless otherwise noted. Individual articles are based upon the opinions of the respective author, who retains copyright as marked. The information on this website is not intended to replace a one-on-one relationship with a qualified health care professional and is not intended as medical advice. It is intended as a sharing of knowledge and information from the research and experience of Dr. Vargas and Dr. Bouv﻿in. Dr. Vargas and Dr. Bouvin encourages you to make your own health care decisions based upon your research and in partnership with a qualified health care professional. If you are pregnant, nursing, taking medication, or have a medical condition, consult your health care professional before using products based on this content.